The fastest and easiest way to schedule your appointment with a doctor is to contact our office. 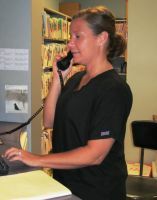 One of our staff members will promptly schedule you. Please don't delay, as the majority of health conditions tend to worsen or recur without the appropriate care. In order to provide the best possible care, our doctors have chosen to remain out of network with most insurance plans except for Medicare. This is because most insurance plans tend to limit the type and amount of chiropractic care a patient can receive. By remaining out of network, our doctors retain the ability to recommend the best treatments and provide the best care possible. Our fees are comparable to the chiropractic co-pays of most insurance plans and are often less. Once the staff reviews the doctor's care plan and your specific insurance policy, they will assist you in choosing the path that is most economical. We have highly affordable rates and flexible payment plans allowing access to high-quality care for you and your family. Our doctors believe that the best health care begins with a complete history and exam. Each patient is unique and deserves a plan of treatment tailored to their specific needs. A thorough initial exam, along with an evaluation of the patient’s medical history, will be performed prior to treatment. To access our new patient paperwork, please click here. Most conditions take time to develop, and in most cases the doctor will not begin treatment until he has completely reviewed the results of the initial exam and x-rays. Once this has been done, patients will be scheduled for a follow-up report and treatment visit. In acute cases of extreme pain, the doctors will often provide immediate treatment on the first visit. You will be given a convenient appointment time for your follow-up visit. Patients are typically seen within a week of their first appointment, when they will be provided with a complete oral and written review of findings. Treatment options for your condition will also be discussed during this time. After the doctor's findings have been discussed, patients will be provided with their first treatment. This may include spinal adjustments, physical therapies, and/or soft tissue therapies.